Dubai: The challenge of being impartial in news production has become even more daunting for journalists, especially in times of armed conflicts, wars, and money politics in the age of 24-hour news services, whether broadcast or online. The need to constantly feed 24-hour news services has placed tremendous pressure on journalists to produce content and break stories by the minute. The change in delivery speed has also impacted how and where journalists get news sources. 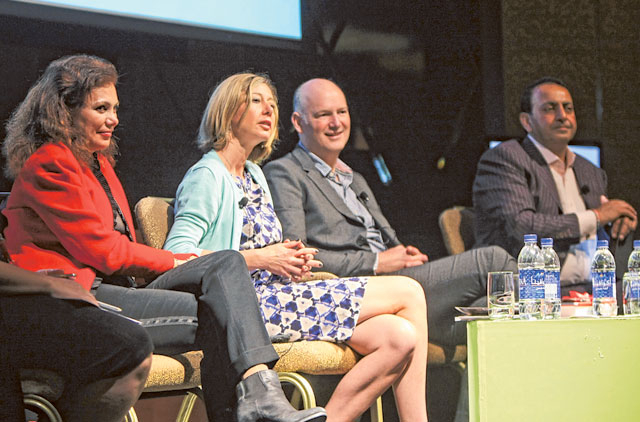 Seasoned journalists like Sunday Times’ Foreign Affairs Correspondent Christina Lamb, Guardian technology editor Charles Arthur, and TV journalist Gisele Khoury all agreed impartial journalism is a great challenge during a panel session on Saturday at the Emirates Airline Festival of Literature. But they said there is still a way to do it. “I think it’s very difficult to be impartial in journalism because you use your own background or where you come from obviously. I believe very strongly that what we need to do is to report the facts and also to try and give voice to people that we meet,” Lamb said. Lamb spoke about her personal experience in writing a corruption story in the government of Pakistan’s former prime minister Benazir Bhutto, who happened to be her close friend. Lamb said she had to report what she had seen, which eventually severed their ties. “I said, we might be friends but these things shouldn’t be happening and it’s my job to write what’s going on,” Lamb said. Media ownership is also a challenge for journalists since each media institution has its own political leanings. In some outfits, advertisers have the power to influence content. “In BBC, you have a solution, there is no advertising and BBC is for the British population. But ownership is really a big question and the question of the future is who owns the media,” Khoury said.